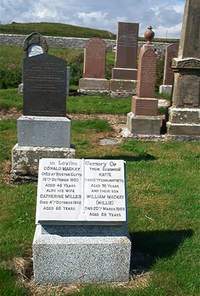 Donald Mackay died at Roster Clyth 16th October 1902 aged 48. Wife Catherine Miller died 4th October 1945 aged 86. Daughter Katie Mackay died 13th February 1976 aged 78. Son William Mackay (Willie) died 20th March 1989 aged 88.